Having founded the bank that became the most powerful in Europe in the fifteenth century, the Medici gained massive political power in Florence, raising the city to a peak of cultural achievement and becoming its hereditary dukes. Among their number were no fewer than three popes and a powerful and influential queen of France. Their influence brought about an explosion of Florentine art and architecture. Michelangelo, Donatello, Fra Angelico, and Leonardo were among the artists with whom they were socialized and patronized. Thus runs the «accepted view» of the Medici. However, Mary Hollingsworth argues that the idea that the Medici were enlightened rulers of the Renaissance is a fiction that has now acquired the status of historical fact. In truth, the Medici were as devious and immoral as the Borgias–tyrants loathed in the city they illegally made their own. In this dynamic new history, Hollingsworth argues that past narratives have focused on a sanitized and fictitious view of the Medici–wise rulers, enlightened patrons of the arts, and fathers of the Renaissance–but that in fact their past was reinvented in the sixteenth century, mythologized by later generations of Medici who used this as a central prop for their legacy. 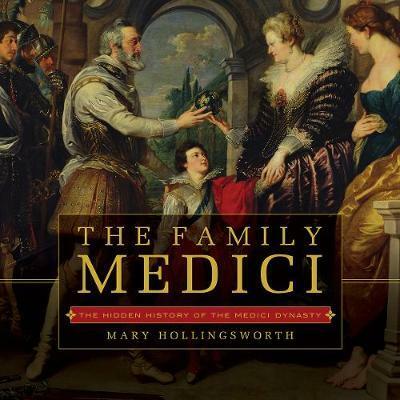 Hollingsworth’s revelatory re-telling of the story of the family Medici brings a fresh and exhilarating new perspective to the story behind the most powerful family of the Italian Renaissance.